Powers/Abilities: Highly skilled human at peak of physical fitness, superfit and superintelligent. Uses a variety of high tech gadgets. He is a skilled mimic, and uses synthetic skin masks which can be swiftly modelled on anyone he needs to impersonate. History: Diabolik is a criminal genius who targets the underworld, assisted by his lover Eva Kant. He is pursued by Police Inspector Ginko. Since his opponents are criminals, Diabolik had no moral qualms about using the most vicious methods when needs required. Comments: Created by sisters Angela and Giuliana Giussani, and intially drawn by Gino Marchesi. His first adventure was published in Milan in 1962 in a pocket-sized format. His appearance is a deliberate homage to the French arch-criminal Fantômas. 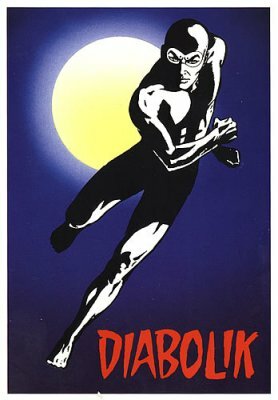 Diabolik first made it to the silver screen when director Mario Bava made the 1968 movie Danger Diabolik. The lead was played by John Philip Law, with Marisa Mell playing his lover Eva. Jonathon Reid notes that Diabolik has an intense love of jewels and will do virtually anything to acquire them. 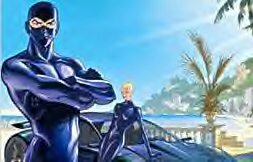 Mike Murphy notes that there was a Diabolik animated series "Only available on FOX Kids European affiliates in the late 90s as it was demurred import to the US as it was deemed "immoral' -- despite the fact that the protagonist was a James Bond-style superthief and was pitted against worse criminals. There was a toyline as well." He also kindly sent me a picture from the series (right). Mike also sent a beautiful picture of the character with his mask down, which I've placed at the bottom of the page.